A newly sequenced genomes study polar bear, made partly in Mexico and considered as the most comprehensive analysis to date on the DNA of this animal, is providing important insights into the evolution of the species, which suggests that climate changes prehistory and genetic exchange with grizzly bears helped forge the polar bear as we know it today. More information about Polar Bears in this documentary. The international study, led by specialists from Pennsylvania State University and the University at Buffalo (State University of New York), provides scientific evidence that the population of polar bears ranged in size coinciding with major weather events in the last million years, growing during cold periods and decreasing in the warm. 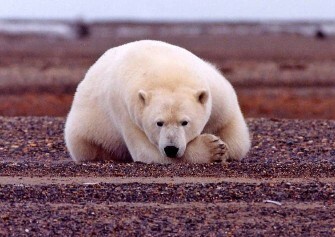 Discovered by the team of Charlotte Lindqvist, professor of biological sciences at the University at Buffalo, and Stephan Schuster, professor of biochemistry and molecular biology at Penn State University, also suggests that while polar bears emerged as a new species does between 4 and 5 million years, these animals may have interbred reproductively extensively with grizzly bears, until much later. This relationship between the two species reproductive may have been a consequence of climate variability on our planet, then, in times with a significant reduction of glaciers, both species may have greater contact with their ranges overlap geographically. Scientists have concluded that polar bears are actually a species much older than previously thought. All indications are, in fact, they are far more ancient than was suggested following a study not long ago. The authors of the new study believe that polar bears emerged as a new species from grizzly bears for between 4 and 5 million years ago, rather than a few hundred thousand years ago stated time. This means that the polar bear definitely survived the warm periods of the history of our planet. But as Lindqvist warns that the species has survived for millions of years does not ensure their future survival in the current global warming. The research has also worked Webb Miller of Pennsylvania State University and National Laboratory experts Genomics for Biodiversity (Langebio) of Mexico, and institutions in other countries.